Which bird has been described as "smarter than you are"? This challenging statement refers to the lovely Quaker Parakeet- you will have to meet one to take the intelligence test! Quaker or Monk Parakeets are incredible nest builders. Generally, they will take over an existing nest and build on top of it, making large apartment buildings! In the wild, Quaker Parakeets eat fruits, seeds, berries and insects. They are prolific breeders. Quaker Parakeets are very intelligent little animals. Owners often report logical reasoning in them. For example, they will call their owners' names to get their attention. Then they declare whatever it is they would like to express using unrelated words and phrases that they have been taught, which are shockingly appropriate to the particular situation! Quaker Parakeets are also great at mimicking noises, and can imitate human speech, other birds and animals, and squeaky doors or household noises. They will even compose song, setting their favorite phrases to simple tunes they know! Be careful if you have other pets with your Quaker Parakeet, as they have been known to chase large dogs, which could result in disaster if the dog is not cowed by the Parakeet's confidence! Quaker Parakeets need lots of exercise and baths, both of which they love. Their aviary should be as large as possible, probably sized for a small Conure or Cockatiel. Quaker Parakeets are mechanically intelligent and can quickly learn to open their cage doors, so be careful! They love to have loose twigs on aviary floors for nest building and need a variety of toys, changed every few weeks, to prevent them from becoming bored. They need fresh water at all times, and a pellet based diet, which consists mainly of fresh fruit and vegetables with seeds as special treats, will be perfect for a Quaker. 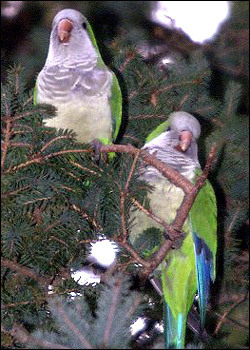 Quaker Parakeets are very hardy and can tolerate some cold. They need lots of love and attention and adore cuddling with you and playing or talking with you. Quaker Parakeets are about a foot in length with very long, gorgeous, green and blue tail feathers. It weighs around 100 grams and the predominant color is green. Lutino, blue-cinnamon, albino, pied and cinammon mutations are available. Generally, Quaker Parakeets have a light gray forehead, face and upper breast. The feathers on the chest have white tips, giving the effect of scalloping. Quaker Parakeets have blue webbing in their primary flight feathers, whose coverts are also blue. The bills of Quaker Parakeets are horn colored or light yellow and their irises are chocolate brown. The feet are generally gray. Quaker Parakeets' tail feathers are gradated in length. Quaker Parakeets consist of several subspecies native to the dryer, low altitude woodlands of Bolivia, Brazil, Argentina, Paraguay and Uruguay. They have been kept as pets in the United States and Europe for years. Because Quaker Parakeets are such prolific breeders, they are illegal in some states. The logic is that escaped birds can breed up into large populations and it is speculated that they could become a threat to crops, though no evidence has been seen. As always, captive-bred birds make much better, healthier, calmer pets than wild-caught birds. They need fresh water at all times, and a pellet based diet, which consists mainly of fresh fruit and vegetables with seeds as special treats, will be perfect for a Quaker. The best Quaker Parakeet cages have bars with 5/8 of an inch spacing. They are as tall as possible and at least 18 inches square. Be sure your Quaker Parakeet is never bored or it will be noisy, and pluck its feathers. This can even get as bad as Quaker Mutilation Syndrome in which they will bite their skin, and then your Quaker Parakeet must see an avian veterinarian immediately. Quaker Parakeets should have lowfat diets, as they are prone to Fatty Liver Disease. Although most Quaker Parakeets keep their noises at a moderate volume, some are very loud. To keep them quiet temporarily, place them in separate rooms from other birds, cover their cages, give them a bath so they will be busy preening, or give them food which takes a while to eat! Young Quakers may be clumsy, so take care that they do not fall and injure themselves from heights! Quaker Parakeets are very prolific breeders and reach sexual maturity between one and two years of age. They build large, three-room nests and lay the eggs in the "back bedroom" area. Generally, the clutch consists of four to eight eggs, which incubate for 23 to 26 days. When the young Quakers are about a month old, the parents move them into one of the frontal rooms of the nest and lay another clutch in the back room. They will breed in the spring through summer and can raise up to four clutches each year! Sometimes as many as seven eggs hatch, but the parents will select only about three babies to raise. The young Quaker Parakeets fledge when they are six to eight weeks old, and handfed babies will be weaned at eight to ten weeks of age. Generally, Quaker Parakeets will begin talking when they are a little over eight weeks of age and comfortably settled in their environment.